Terminally misfolded or unassembled secretory proteins are retained in the endoplasmic reticulum (ER) and subsequently cleared by the ER-associated degradation (ERAD) pathway. The degradation of ERAD substrates involves mannose trimming of N-linked glycans; however, the mechanisms of substrate recognition and sorting to the ERAD pathway are poorly defined. EDEM1 (ER degradation-enhancing alpha-mannosidase-like 1 protein) has been proposed to play a role in ERAD substrate signaling or recognition. 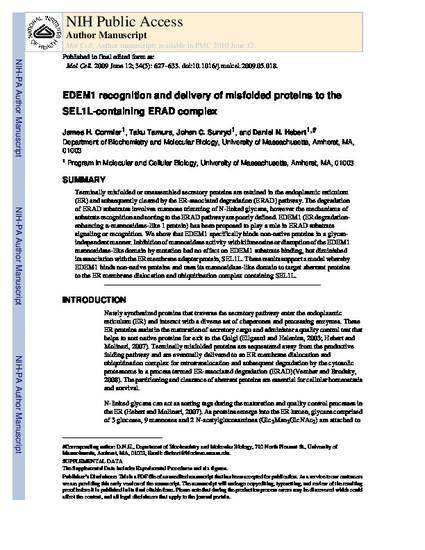 We show that EDEM1 specifically binds nonnative proteins in a glycan-independent manner. Inhibition of mannosidase activity with kifunensine or disruption of the EDEM1 mannosidase-like domain by mutation had no effect on EDEM1 substrate binding but diminished its association with the ER membrane adaptor protein SEL1L. These results support a model whereby EDEM1 binds nonnative proteins and uses its mannosidase-like domain to target aberrant proteins to the ER membrane dislocation and ubiquitination complex containing SEL1L.